Meadow. Woods. Beaches. Old school adventure. Bôn is a beautiful Welsh word meaning ‘base’ or ‘root’. It is more usually used in the phrase, 'yn y bôn' which literally means, 'at heart', ‘fundamentally’ or 'at it's root'. 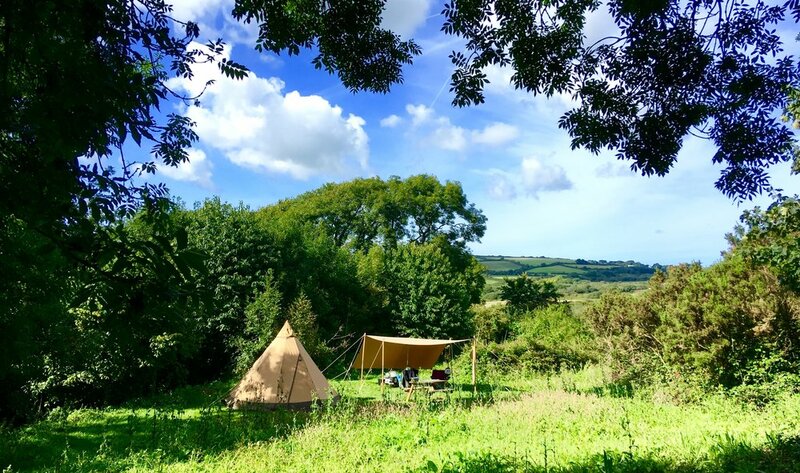 We invite you to stay in our magical west Wales coastal valley campsite, at the heart of Britain’s only coastal National Park. Our 29 acres are teeming with wildlife, meadows and trees. 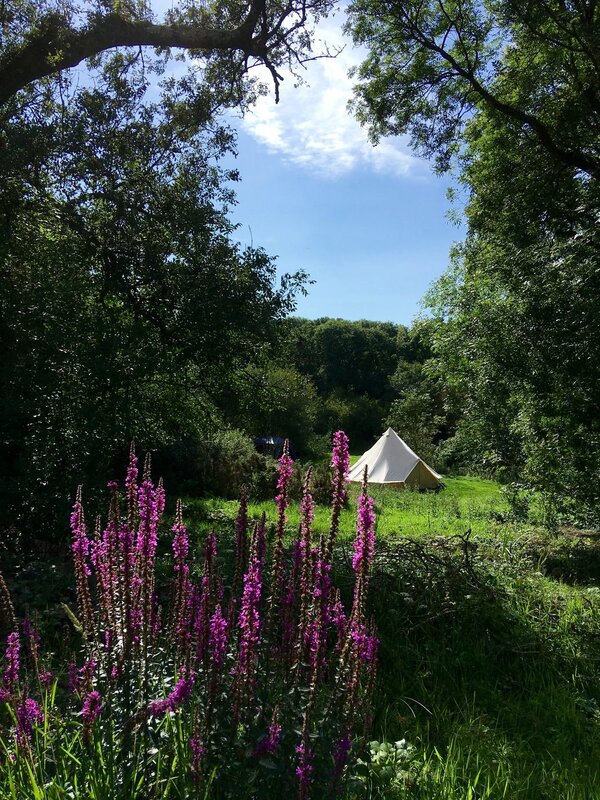 We are a basic eco or wild campsite, and the ideal base for your Pembrokeshire summer adventure. 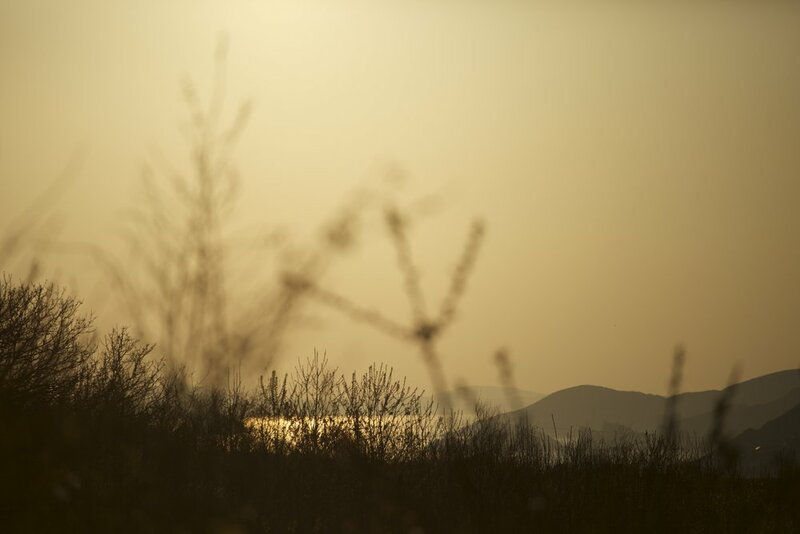 A chance to reconnect with family, friends and the great Pembrokeshire outdoors. This year we have 6 spacious pitches in the meadow. Each clearing enjoys a fantastic view, a picnic table, fire pit and plenty of space to bring extra family or friends. We encourage you to have camp fires and include the first bag of firewood on your arrival. What is camping under the stars without a campfire? There is a compost toilet in the field serviced daily, and a tap for fresh drinking water. We have 20 acres of wild woods for you to explore and enjoy. In the shelter of the woods you can hear a mixture of bird song, the breeze in the trees and the murmur of waves on the shore. We have 7 clearings, far apart so you don’t feel on top of each other. There are some pitches more secluded than others, so get in touch if you really want to be camping out in the wild woods. There is a washing up sink, compost loo serviced daily and drinking water provided in a central position. This is the perfect chance for the whole family to enjoy the freedom of the woods. The perfect chance for you to relax and enjoy the calming effects of nature. Much of the habitat has been left undisturbed for many years and we encourage you to share any wildlife sightings in our book especially for that purpose as we build up a picture of exactly what species fill this rich ecosystem. So far as possible we want to live in harmony with the wildlife that shares our life here. We see ourselves as temporary stewards of this patch of beautiful Pembrokeshire – and a key part of our habitat management plan is to secure it for wildlife and make any changes slowly, and only when we have studied what is already here. We encourage you to use only eco products on site, and we provide these for you during your stay. We have one compost toilet – serviced daily - and a communal washing up area situated in the shed. Also in the shed are 2 hot electric showers and 2 flush toilets. main barn we have a chest freezer, fridge, dining area with local information about things to do and a tide timetable updated every day. We have two kayaks for you to borrow at no extra cost but these are only available on a first come, first serve basis. When was the last time that you were truly aware of the cycle of the moon? Here you can’t avoid it. And that’s a good thing! When the moon is at its fullest and the sound of the surf is rolling up the valley, it is somehow easy to feel in touch with the mystery of it all. And when the moon is dark, the skies are even more brightly covered with a blanket of stars. With so little local light pollution, it is very easy on a clear night to see the milky way and start teaching your children about the constellations around the warmth of a campfire. We have two powerful telescopes for those wanting to take a closer look. A torch is a good idea, but why not give your eyes a chance to get accustomed to the dark before you decide to switch it on! We are less than a 10 minute walk from the Victoria Inn and micro brewery, a good place for a pint of real ale. Opposite the pub is a children’s playground and tennis court. The post office and shop for basic groceries can be found at the centre of the village. Price is £35 per night, based on 2 adults sharing a pitch. communal washing up area including shared fridges, freezers and dining area in the shed for rainy days. If possible, we prefer campers to make whole week bookings during school holidays, from Sat to Sat or Fri-Fri, £245 per week. email boncampingpembrokeshire@gmail.com to make your booking. Week long stays in the Summer are Saturday - Saturday for £565. Minimum stay is 2 nights, at £85 a night. Bedding (duvet and pillows plus covers) is an extra £10 per person per stay. If you book online using the calendar below, you will be asked for full payment with your booking. If you contact us directly by phone or email your booking we are happy to accept 50% deposit at time of booking, with the balance to be paid no later than 6 weeks before arrival. Please check our Terms and Conditions. We would love to welcome you to Bôn Camping for your summer adventure. The quickest way to see if we have availability is to use the calendar below, then get in touch to book with us, by phone or by email. If you have a question about our campsite, feel free to pick up the phone and ask, we are happy to help in any way we can. If you already know Pembrokeshire then you need no convincing that this is one of the most beautiful places in Britain. With 180 miles of coast path, more than 50 beaches, island nature reserves, historic castles and seemingly endless options for messing about in the sea, we believe that whatever the weather you will find something to enjoy. We are only a four and a half minute drive from Newgale sands, one of Pembrokeshire’s most impressive blue flag beaches. A full two miles long at low tide it is a favourite haunt for surfers, walkers, sunbathers and families. We are in the middle of St Brides Bay famous for its beaches, havens and harbours. To the north is the ever more rugged north Pembrokeshire coast and historic St Davids. To the south lies the Dale Peninsular, the wildlife islands, magnificent Pembroke Castle, Tenby and the famous southern beaches. 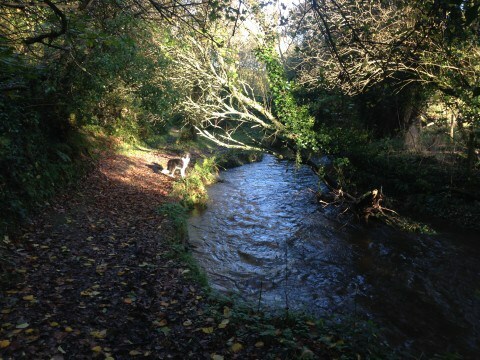 We overlook the valley of Brandy Brook, so put on your hiking boots, pack a picnic and head down hill for a walk up stream, towards the ruins of an old mill. This is a circular route that brings you out past Roch Castle and through the village before returning back to your tent for a well earned rest. There are plenty of activities to suit all ages and abilities in the area. 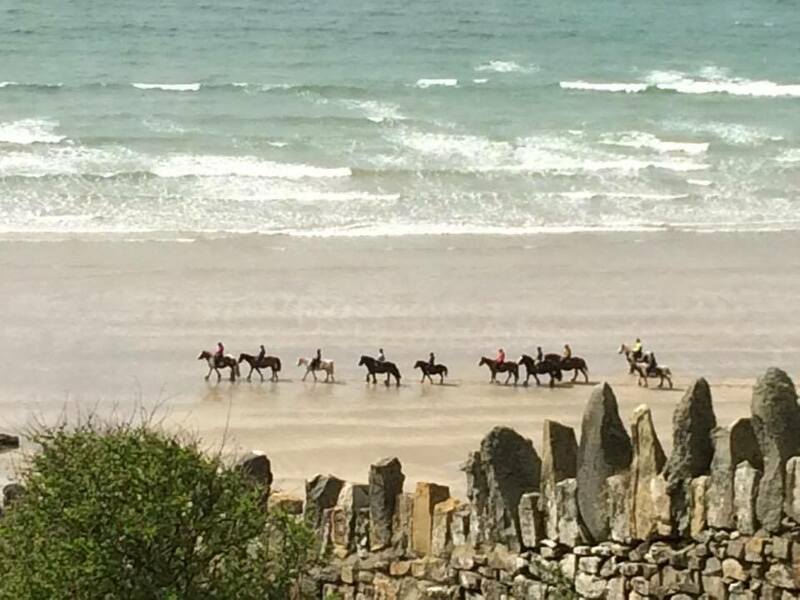 Walk the coast, gallop on a horse along Druidston beach, go coasteering with experienced instructors, or why not visit an iron aged hill fort, or any of the beautiful gardens dotted around the county. For children and adults alike, there is plenty to do and see throughout the seasons. Do you have a question or need more details? Please don’t hesitate to contact us!